When people hear about Atlantic City, New Jersey (USA), they think about casinos, gambling, and the seashore. On Friday evening, 24 October, 2014, hundreds of people who gathered in Our Lady Star of the Sea Catholic Church thought about Atlantic City, New Jersey for a very different reason. They came to applaud and say a thanks to a woman on the occasion of her retirement - Sister Shamus Zehrer, who for 46 years ministered, taught, and was principal of what is the only surviving Catholic School on the entire island (once there were several such schools). The Sisters of Mercy are the only ones who have remained, serving hundred of lower-income families in a school and in a city that is now suffering after the collapse of four, and soon-to-be five casinos, leaving thousands of workers unemployed in a city and region down on its luck. 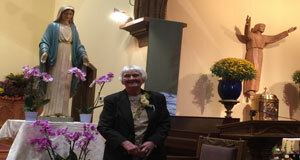 Several Sisters of Mercy joined priests, a deacon, family, and many friends of this woman who has ministered faithfully with other Sisters of Mercy and lay colleagues to educate many children over the years. 46 years “walking the talk” with the poor of Atlantic City is no small matter. The children of Our Lady Star of the Sea School, under the direction of Sister Christine, another Sister of Mercy who teaches in the school, provided beautiful music for the Mass. In a city and Church that has had lots of bad news these past weeks, months, and years, celebrating and thanking Sister Shamus was an evening of good news about faithful service to all God’s people in a city and world that can do with more such good news. After the Liturgy, everyone was invited to a buffet supper in the gymnasium of Our Lady Star of the Sea School, Atlantic City, New Jersey, USA.